Platform Size 44.6" x 40.5"
Scale Size 44.6" x 40.5" x 36"
Integrated Wheelchair RampIf ya need to weigh with a wheel chair, the Seca 664 is the way to go. 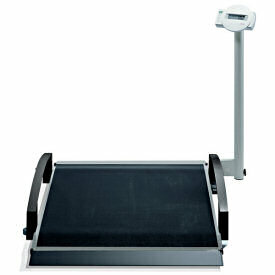 This medical scale has integrated ramps and side rails to safely weigh patients with a chair, wheelchair, or walker. Auto-Off FeatureIf ya have ever had the batteries in something run out because you forgot to turn it off, you'll realize what a blessing this feature is. When ya use the 664 with battery power, the scale will automatically turn off after a few moments of inactivity.